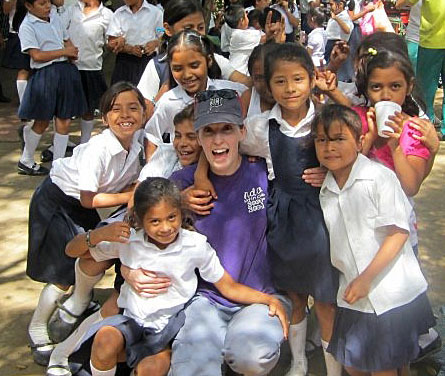 Jeanetta Mohlke-Hill posed for a photo with students at the Reina Sofia Elementary School during the Honors College’s trip to Nicaragua last year. Dump dwellers refers to people who build their houses on and live in garbage dumps, where they make a living collecting and re-selling recyclable items found in the mountain of trash. This is the third year Armstrong and students from the Honors College will go to Managua, the capital of Nicaragua. The Honors College has been working with International Samaritan. The Ann Arbor-based philanthropic group works to raise awareness about dump dwellers and to improve conditions for those in the developing world, with a major focus in the Latin Central American countries. There are 10,000 people living in the LaChureca Garbage Dump in Managua, according to the International Samaritan website. Some of the efforts of human rights groups like International Samaritan have been apparent in recent years, as the Nicaraguan government has felt enough international pressure to begin cleaning up dumps. During their overseas trip, Armstrong said UT students will work with Reina Sofia Elementary School students, as they have done in the past. Two years ago, UT students helped the school build a nursery and last year a kitchen. This year, honors students plan to teach the Nicaraguans how to build hydroponic systems so they can have a green, self-sustaining way to grow vegetables and raise fish. It will be a vitally important service, as LaChureca Garbage Dump lies near the toxic Lake Managua. The systems will be built out of readily available pieces, scraps, old piping and other equipment that can be found in the dump. Students already have been briefed on how to make hydroponic systems sustainable and to show the Nicaraguans how the pipes and tanks should be put together. Two area high school students will join the honors students on the trip. Armstrong said that in the future, she will look to get more local high schools involved. This entry was posted on Wednesday, February 27th, 2013 at 4:02 am and is filed under Features, Honors, Natural Sciences and Mathematics, News, UToday .